A horse’s skin, as with any mammal, including humans, is vital to the animal’s survival. It serves as its anatomical boundary and as the principal organ of communication between the horse and the environment in which it lives. As is the case with other body components, the skin of a horse is subject to attack on a number of fronts, ranging from infectious bacteria to biting insects. Below are some of the most common problems. A general allergy of the skin, in which innumerable swellings (welts) occur, may be caused from the surface (for example, by certain shampoos) or from within (by the ingestion of certain plants). The body’s autoimmune system malfunctions, causing the body to act aggressively against its own normal defences. This results in an overactive immune system, and allergy symptoms ensue. So concentration from acupressure points would be around the immune system function, the resultant allergy signs and symptoms, and the surrounding sensitivities, causing blockages in the body. Eczema is a kind of inflammation of the skin (dermatitis). 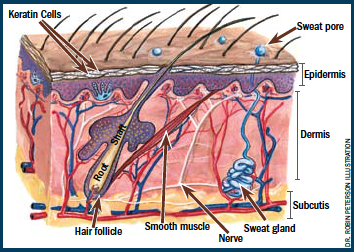 It is an itchy condition, characterised by many small fluid-filled blisters which are beneath the hair. These burst and the contents form a dry crust. Also, there is scaling of the skin. Eczema is often an allergic response, and is often associated with diet and the digestive system. Concentrate EquiHealth on the digestive system as well as the specific contact points. This can be due to many causes, for example, skin parasites, the girth strap of the harness, allergy, boredom. Itching leads invariably to scratching and possibly skin damage. Diagnose a particular cause if this is possible, and concentrate treatment on that cause rather than just surface symptoms. This will also help to produce a future protection against severe recurrences. Ensure that the area affected isn’t caused any undue further stress via application of any treatment. EquiHealth is safe to use, even on affected areas. This is a self-inflicted inflammation of the skin. A common cause is boredom, which, if not treated, may become a habit. It involves the horse biting and scraping areas of the skin with its mouth, nibbling with teeth, excessive licking with the tongue, and even, where reachable, scraping with the hoof. Common triggers can be changes in environment, stable/pasture mates, ownership, changes of feed, and other environmental factors. Because this is, in part, a psychological condition as well as a physical one, both emotional and physical acupressure location points should be included in a course of treatment. This occurs when a horse is too long in the heat. It is also a feature of infectious disease. Certain foods stimulate sweating, for example oats and maize, so it is important to ensure an optimal and individual diet, suitable for your horse and their environment. Pronounced pain also causes sweating. Ensure there are no behavioural or psychological factors triggering the symptom, and diagnose any physical disturbances that it may be related to. Treat these underlying causes in line with the instructed stimulation points.